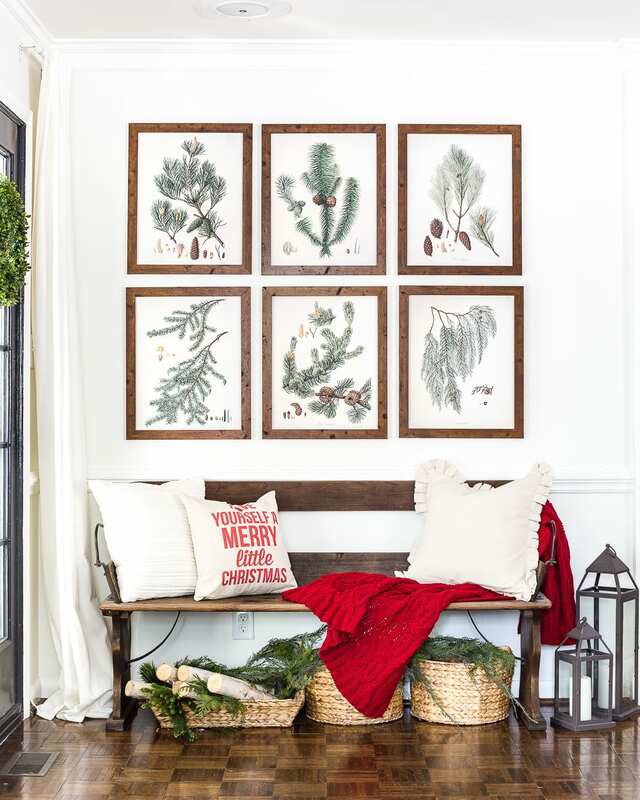 A Christmas entryway bench and a free downloadable set of winter evergreen botanical prints for a printable gallery wall. I’m either going to get Buddy the Elf-level enthusiasm or bah humbugs in response to today’s post. Because we can officially start talking about Christmas, right? Right?! Ever since breaking our rule two years ago about #noChristmasbeforeThanksgiving though, I’ve discovered I really love getting my holiday to-do list done early because then Robert, Olivia, and I can just enjoy our family time throughout the month of December without schlepping through crowded malls and unraveling tangled lights. So of course, a winter botanical set HAD to happen! I love that they’re simple, fresh evergreen botanicals without any red so that they can stay up all the way through February even. I keep all of my seasonal sets of botanical prints in the frames- summer, fall, winter- and just rotate them whenever I feel like it, so it takes up no storage space at all. Maybe, in March, I’ll whip up a set with spring blossoms to round it out for the year. Or you can choose to print them directly from your computer as 8x10s to put in 8×10 frames, or if you want large frames, you can mat the 8x10s. I set up the rest of our $35 Craigslist bench (wish I could find another one like it online for y’all but no luck) mostly with pillows, baskets, and faux greenery I already had. I love sticking to mostly neutrals from my decor wardrobe capsule like these lanterns, plain white/canvas pillows, and water hyacinth baskets we use for storing shoes. 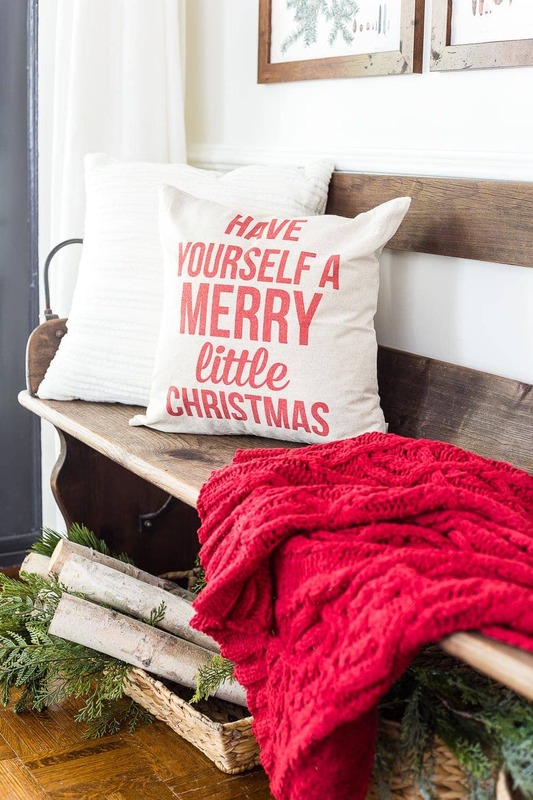 And I just threw in a punch of Christmas with this red throw I picked up at Target and this pillow cover from Linen and Ivory I used on an insert already in my stash. I found these $12 boxwood wreaths at IKEA on my last visit that were just too good to resist. 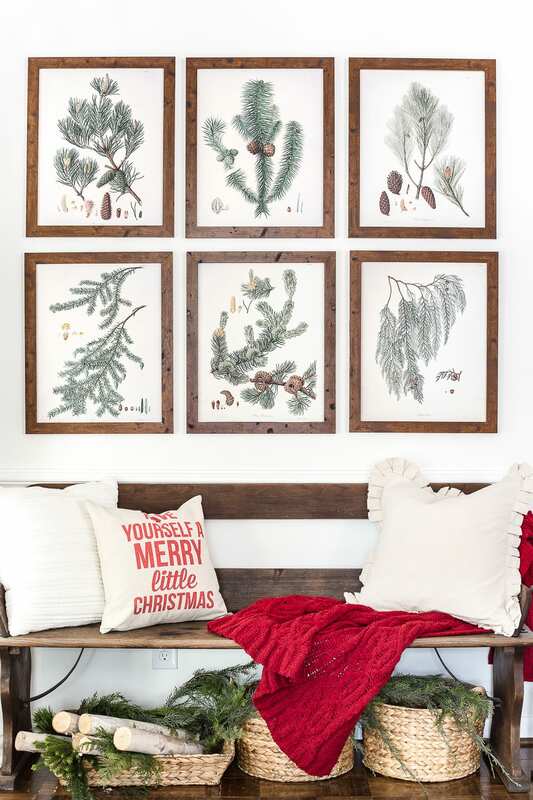 They are perfect for adding some Christmas to our living room’s wall of French doors, but I have a plan to jazz them up even more. See? I’m already not doing so great at this “use what we already have” goal. Sigh… A for effort? Haha! 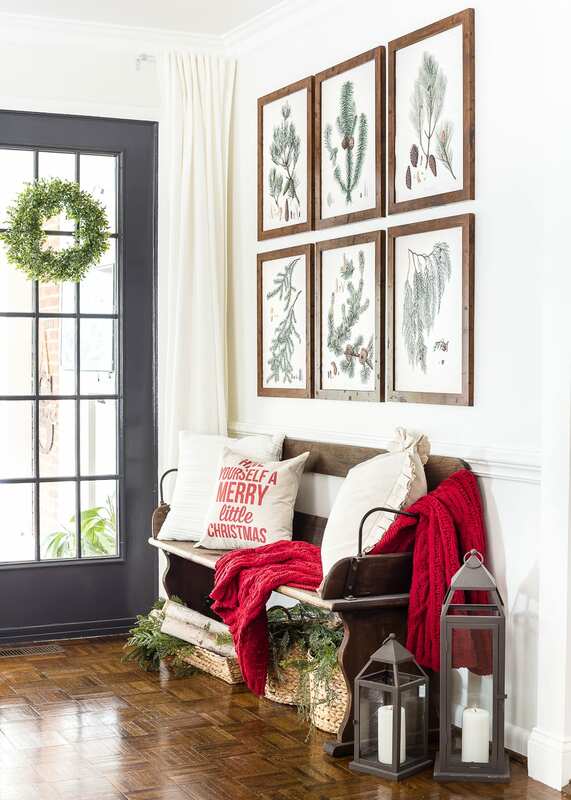 Are you ready to start decking your halls? Or are you savoring fall for a while longer? I really couldn’t tell you which I love more. Merry (early) Thanksgiving, y’all! Signed, a confused Southerner still wearing T-shirts and flip flops. Your prints are stunning and I love love love your foyer! Gorgeous! Thank you so much! I’m going to put these on a wall in my bathroom! 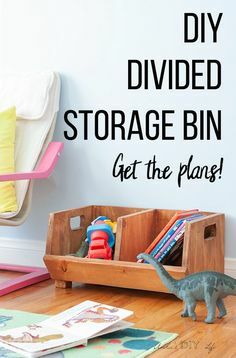 Such a great printable and I just love all your decor! Yes, I’m Buddy the Elf! I love to work with paper, and my family totally agrees with my new name! 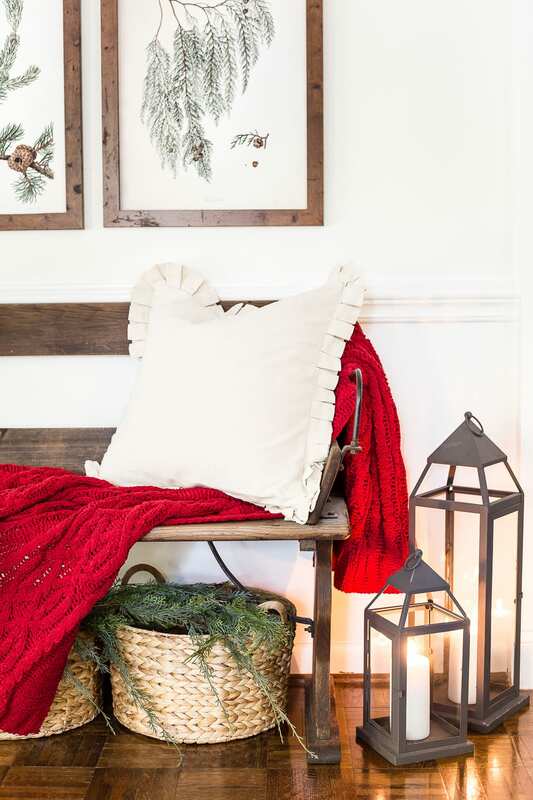 I can’t wait to see the rest of your Christmas decor! I was just crushing on the Fall prints and thought “wonder what she’ll do for Christmas?” Love these, I’m def going to copy this!! Your space looks so lovely and festive! Thanks for sharing where to find the boxwood wreaths! I’m adding them to my list for the next time I make the trek to Ikea. 🙂 Such a great price! I love botanicals hung like that! Natch, I now need to head to IKEA for some boxwood wreaths! They really knock it out of the park with their faux plants! 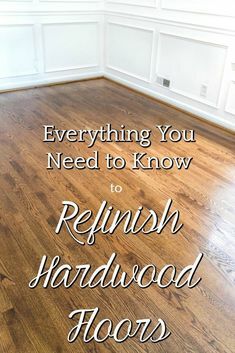 Just found your blog and absolutely love it. Am already forwarding your site to a friend so she can enjoy it. Can’t compliment you enough on the artwork and all the wonderful ideas you share with your fans. Count me as one of your biggest ones. P.S. looks like my pantry will have some new labels after the holiday season is over. LOVE these prints Lauren! And such a bonus that they can be left up past Christmas. The house always feels a little empty when the decorations come down, so it is nice to have transitional things that can stay out. Beautiful printable! 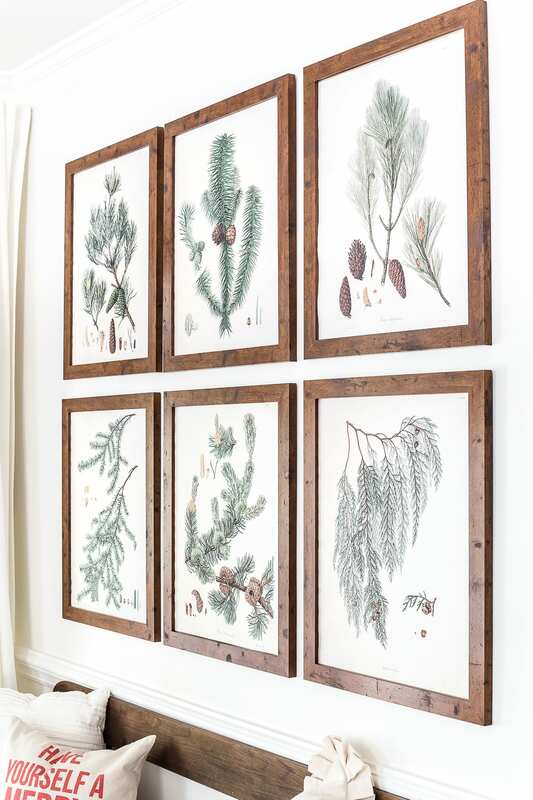 Thanks for the botanical prints of the pine branches. I look forward to using them all winter – until at least Valentine’s Day. I love the decor in your home and that red throw is to die for. Just beautiful. What color are your walls and door? I have a red or crismon/khaki couch and don’t know what paint color to use with it. The last color I picked ended up being very yellow. 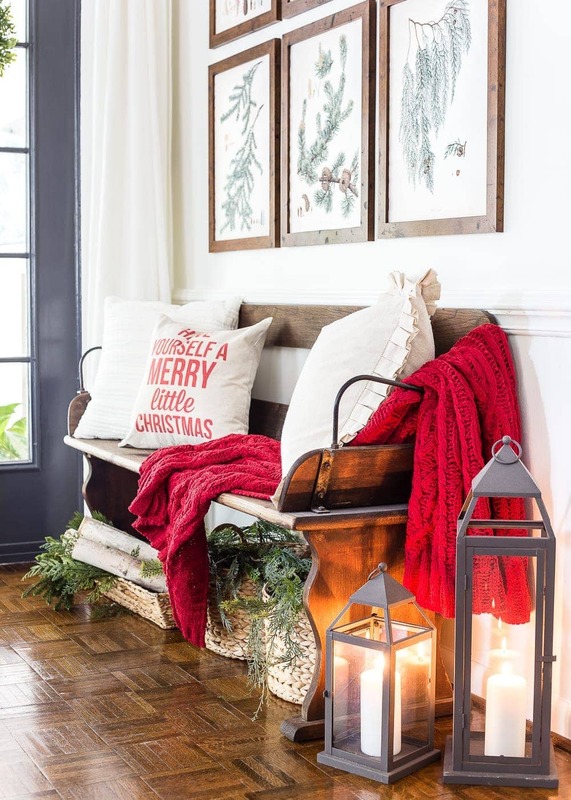 Are the walls the same color as the walls in the picture of the cranberry bench? Thanks in advance! 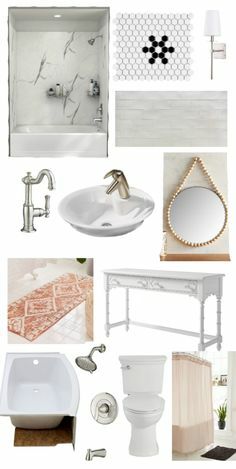 Love your home and decorating style! Lovely prints and great idea! I love your place – looks really cozy! These are incredibly beautiful. I love that you can leave them up for the winter. wow, thank you. 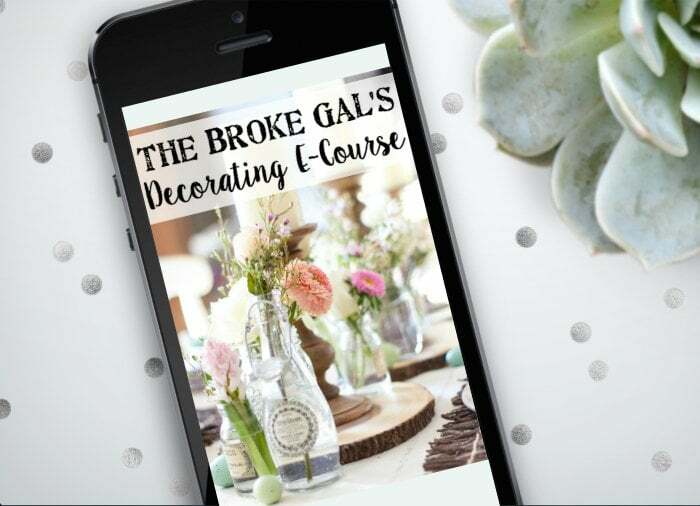 Your blog and your home are beautiful. Oh my gosh I just love these botanical prints. They are so beautiful! What type of paper did you use? Thanks so much for the free printables. 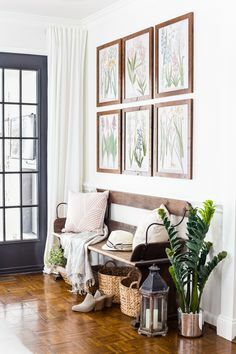 I’ve never tried decorating with botanical prints but love these! Your home is gorgeous! Thanks, Debra! I just used engineer prints from Staples in regular computer paper thickness. When you print the art on the larger paper size for the 16×20 size frame do you have to trim the paper once you insert them? Yes, I had to trim my edges since it’s a 16×20 image on an 18×24 sheet. I just stumbled upon this! Thank you so much for the printables (and the link to the affordable frames). I’m definitely doing this (and will have to catch up with past seasons as well)! I used these and had them printed but the background came out a bit red. Looking back on the file, the images are also a reddish hue. Yours are white. Any ideas? Love these so much but unfortunately Staples and now my Office Depot won’t print them for me like they did the fall prints. I’ve tried two different locations and they say they won’t print them on blueprint paper….they have to be done on poster board which costs significantly more, bummer! Oh no! I’m wondering if a lot of people are printing these all over the country and because it’s so inexpensive for us to do, it’s costing them money. So bummed! My local Staples still lets me whenever I do it, but I wonder if they’ll one day tell me the policy has changed. I’m going to keep looking to see if there’s still a cheaper alternative out there somewhere than printing on poster board. 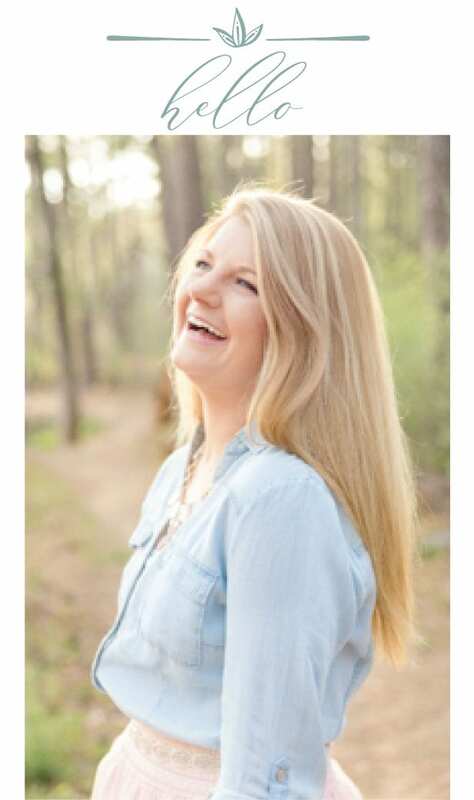 Lauren, thank you for your sweet words of encouragement to mamas everywhere! I have four children from 11 – 18 years old. When they were younger I remember those moments of not feeling like I had it all together like everyone else “seem” to. Although I am much better at it now, there are days that we all need reminding. Your words will have impact on the lives of others, way longer than beautiful pictures and home tours (although those are fun to look at!) Thank you for speaking “truth” while using your talent. Thank you, Tracey, for taking the time to write such kind words. 🙂 It makes what I do worth it. I absolutely adore these! I am trying to print on printer, but they come out a little on several pieces of paper. How do I change the size? Hi Fanny, be sure to check your printer settings before printing. Change the printer setting to “fit to size or fit to page”. Also, click on print preview before printing to make sure it is on one page as well. Good morning! My local Staples would not only NOT print these as engineering prints, but they also said they wouldn’t print them because of copyright issues. Have you run across this before? Michelle, I never like hearing that someone has had trouble getting these printed. These images as public domain, which means they have no copyright limitations. There should not be any violation issues if you have them printed. Maybe try again when someone else is working or maybe you can inform them of the ability to print. I hope this helps. Let me know if you have any questions. Thank you! I ended up being able to print them online, and they came out great. Your gallery looks so straight. Do you do anything special to keep your frames from moving/becoming crooked? Did you use just the single picture hanger that came with the frames?